Bond 45 – All Tickets Inc. 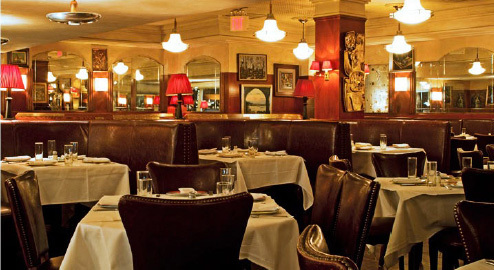 This Italian steak and seafood restaurant is located in the heart of the theatre district and within walking distance of the major Broadway shows. The exterior of Bond 45 is hard to miss. The bright red and blue neon lights and red canopy over the main entrance serve as a welcoming beacon to patrons. Inside, you’ll find a warm, welcoming atmosphere that includes dark rich wood and leather and gentle amber lighting. Both booths and tables are available in this multilevel eatery. The entrée menu includes homemade Fettuccine Ragu, Organic King Salmon Steak and Sliced Prime Steak Gorgonzola. Appetizers include tasty Bruschetta al Gorgonzola and Insalata “Quaranta Cinque” served with a balsamic vinaigrette dressing. The Italian food is authentic, the steaks are tender and the seafood is fresh. The Bond 45 restaurant has a rich history and is large enough to ably handle groups of theatergoers. Tasteful, relaxed and dedicated to fine service, Bond 45 is designed to serve the pre-theatre crowd.